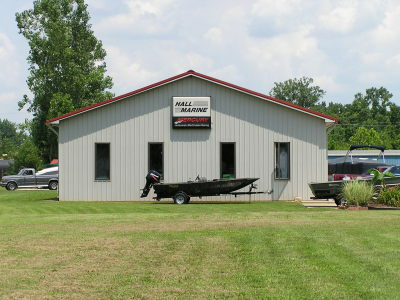 We are a family owned and operated boat dealer located on the banks of the Ohio River in western Kentucky. We came into this business with an outboard boat racing background and have based our business on mechanical excellence. We are now a proud member of CRESTLINER Boats' family-and we look forward to carrying on their 65 year tradition of serving fisherman and fun-seeking families as well! We feel the CRESTLINER mod-V boats are one of the best in their class and we will roll into the future with CRESTLINER's history and dedication to OUR success and our CUSTOMER'S satisfaction. WE HAVE BUILT OUR REPUTATION & OUR BUSINESS ON OUR MERCURY PRODUCT KNOWLEDGE. We continue to specialize in Mercury Outboards and Mercruiser Service. We have been an exclusive Mercury dealer since we opened our doors 20+ years ago and now-more than ever-we are dedicated to providing our customers with Mercury's full-line support of engines, parts and award winning service. If parts are what you are hunting, chances are we have what you are looking for. We literally have thousands of parts-NEW & USED-and props for all Mercury, Mercruiser products. And--if we don't have them on the shelf--we will be happy to get them for you quickly and accurately. At Hall Marine we have earned and retain a 99-100% ongoing Mercury customer satisfaction rating (CSI) from our customers-and we are very proud of that! Our long-time customers depend on us because we have the knowledge and experience to get your boat custom rigged-propped-and the parts you need-RIGHT-the first time! At HALL MARINE, we are committed to SERVICE. That's what we do BEST! And unlike the "big-box-stores", we SERVICE WHAT WE SELL and we are dedicated to selling our boats and engines, parts and props--ONE AT A TIME--making sure to fit the client's needs and expectations--every single time. Come join our Team Hall Marine and experience the difference that our experienced & reliable service makes!